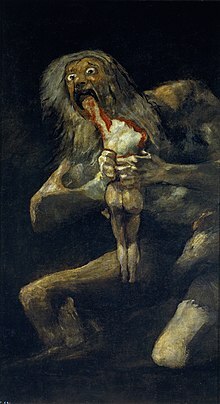 Saturn eating his children is a painting by Francisco de Goya. A delusion looks real, and it can be very difficult to convince someone it is false. A delusion is a false belief held by a person. If doctors talk about delusions they mean that the false belief is the result of some disease, usually a disease of the mind, such as paranoia, schizophrenia or bipolar disorder, but not always neccesarily, delusions can come in many different forms such as political differences, economic differences such as a god complex upheld by someone who believes they are all powerful and many other types. Those holding the belief are absolutely certain of its truth. The beliefs may be implausible or bizarre. A doctor or psychiatrist may say that a delusion is false, because it seems to be unlikely or bizarre.Psychiatrists rarely have the time or resources to check the validity of a person’s claims; this means that some true beliefs are erroneously classified as delusional. This is known as the Martha Mitchell effect, after the wife of the attorney general who alleged that illegal activity was taking place in the White House. At the time her claims were thought to be signs of mental illness. Only after the Watergate scandal was she proved right, and sane. Treating delusions is difficult, but in some cases antypsychotics can be used. If the delusions pose a risk to the health of the patient (if consented) or the health of others, people may also be treated against their will. ↑ Myin-Germeys I, Nicolson NA, Delespaul PA (April 2001). "The context of delusional experiences in the daily life of patients with schizophrenia". Psychol Med 31 (3): 489–98. PMID 11305857. ↑ Spitzer M (1990). "On defining delusions". Compr Psychiatry 31 (5): 377–97. doi:10.1016/0010-440X(90)90023-L. PMID 2225797. http://linkinghub.elsevier.com/retrieve/pii/0010-440X(90)90023-L.
↑ Young, A.W. (2000). "Wondrous strange: The neuropsychology of abnormal beliefs". In Coltheart M., Davis M. Pathologies of belief. Oxford: Blackwell. pp. 47–74. ISBN 0-631-22136-0. ↑ Maher B.A. (1988). "Anomalous experience and delusional thinking: The logic of explanations". In Oltmanns T., Maher B. Delusional Beliefs. New York: Wiley Interscience. ISBN 0-471-83635-4. This page was last changed on 7 February 2019, at 17:21.